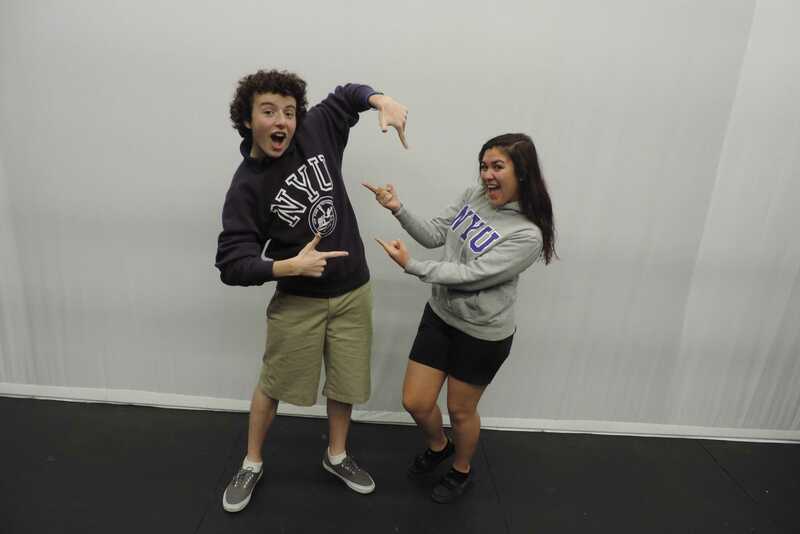 BFFs Trevor Lown and Andrea Martinez wear their NYU sweatshirts with pride. Three SMCHS students watch as their dreams become realities. It has come to be that time of year that all seniors are anxious for: college acceptance season. Auditions are done and the results are coming back, and three seniors are realizing their life long dreams of continuing their performance arts are not as far away as they may seem. In kindergarten, 7-year-old Andrea Martinez was asked what she wanted to do when she grew up. Unlike the typical answer a child would give, like become a firefighter, rock star, or vampire slayer, Martinez knew exactly what she wanted to do: attend New York University. 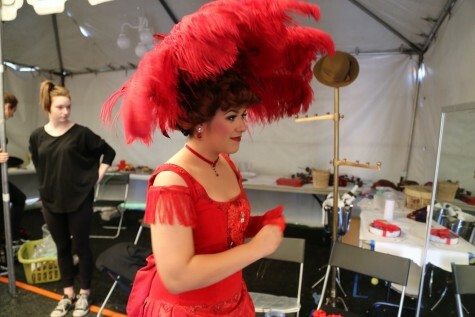 Senior Andrea Martinez gets transitioned into Dolly for her lead performance in the most recent musical “Hello Dolly!”. Flash forward to when Martinez was in her first performance as Mrs. Claus in her fifth grade Christmas production. This was the performance that would change her future. Martinez started to seriously focus on theatre in eighth grade, where she participated in community theatre in Arizona. Her parents supported her acting, but had always advised her to keep it as a hobby rather than a career choice. Their thoughts changed, however, when she was nominated for the prestigious award of Best Lead Actress in a youth musical. “We were all shocked, and it was then that we all realized that maybe I did have the talent to carry me through this crazy whirlwind that is theatre,” Martinez said. It was no surprise that after years of dedicating her time to theatre, Martinez entered senior year with her application to New York University, Tish School of the Arts ready to apply Early Decision Binding. The school is in the heart of Manhattan and close to Broadway, so there are many opportunities for theatre students to immerse themselves in the program, not only at school, but around the city as well. Regardless of all the opportunities available, the fact that it is across the country is still a hard concept for Martinez to grasp. 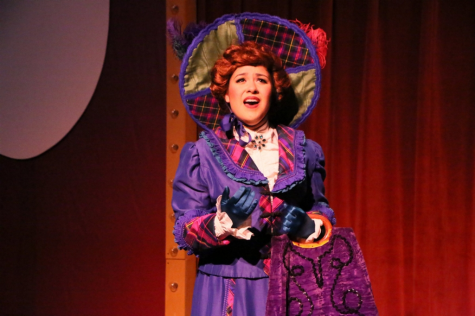 Senior Andrea Martinez on stage performing as the lead character in “Hello Dolly!”. No matter how far she goes, Martinez knows SMCHS has prepared her to be successful by training her to be organized in order for her to stay focused and driven. Finally knowing what your future holds is every senior’s dream and, for Martinez, she gets to pursue her life-long dream of attending New York University. 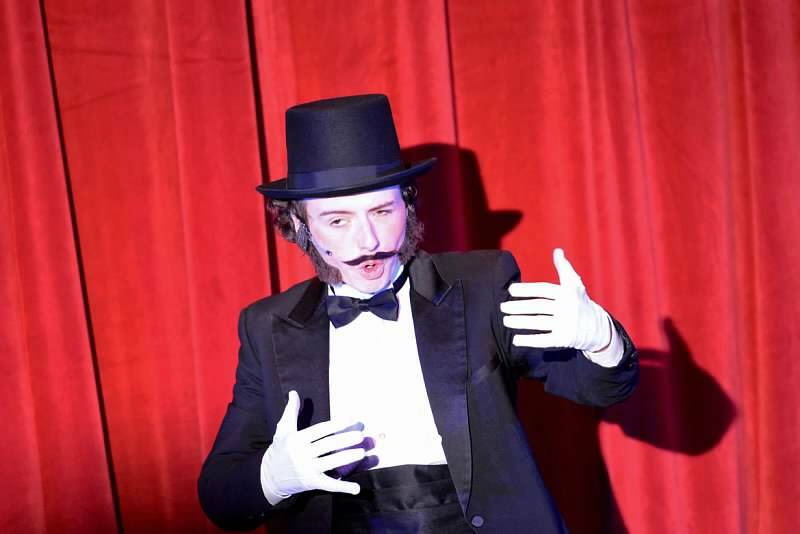 Trevor Lown may not have known his path in kindergarten, but come sophomore year he decided that his love for theatre was worth pursuing in college, and what better place than to aim for Tisch? Lown’s training did not begin as soon as he could talk. Instead, his first show was during freshmen year, and he did not even think to pursue it in college until sophomore year. Senior Trevor Lown performs in “Hello Dolly!”, his last production at SMCHS. After he found his passion for acting, Lown decided to get serious about it junior year when he enrolled in IB Theatre. Being in IB Theatre opened a lot of doors for Lown, including the opportunity to go to the International Thespian Festival in the summer, which is a weeklong theatre festival in Nebraska for thespian troupes. “It was one of the best weeks of my life, and I think it is here [at the festival] that I really decided that theatre is what I wanted to do for the rest of my life,” Lown said. SMCHS gave Lown the ability to grow as an actor and showed him that it was possible to follow his passion into college. With his past experiences in the Talon Theatre program and his future at Tisch, Lown is able to visualize his career. Senior Maeve Gerrity fell in love with dance at 12 years old and decided her freshman year it was a career path she wanted to follow. In order to become the best she could be, Gerrity danced on the SMCHS Dance Team, enrolled in IB Dance junior year and danced in a private studio, where she averaged 25 hours of practice a week. Senior Maeve Gerrity leaps through her last semester of high school at senior pictures. Gerrity made it to senior year confident in her dance skills, which gave her the courage to audition to seven college dance programs. Her motivation and talent gave her multiple options to dance next year as a freshman, including University of Oregon and University of Alabama, but at the end of the day she committed to joining the Aztec dance team at San Diego State University. 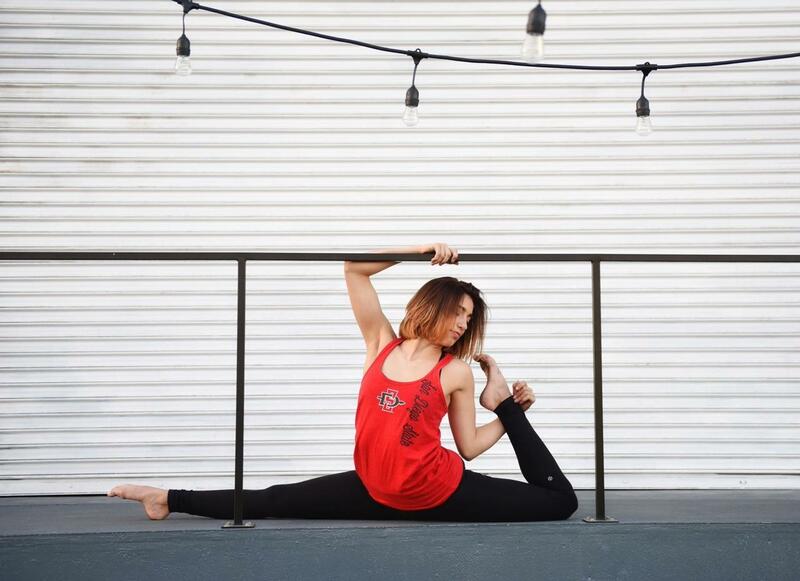 Senior Maeve Gerrity shows off her SDSU pride while showing off her flexibility. “I really enjoyed SDSU because when I went for my audition the faculty was very welcoming and the girls who helped run the audition were nice, which made me feel comfortable,” Gerrity said. Not only is SDSU a great school academically, but it is one of the top ten schools for dance in California. “I thought it would give me the upper hand to attend a school in the area where dance is so prominent,” Gerrity said. Nothing can hold down senior Maeve Gerrity. As for the next four years, Gerrity is excited to dance her way through college and take advantage of all the opportunities SDSU has to offer. With her future set in stone, and her dancing shoes packed and ready to go, Gerrity is on the path to fulfilling her dreams of becoming a dance coach and choreographer.